It was an early morning for me, up at 6:30 am. Making sure to put on my green for St. Patrick’s Day, I left my house at 7:30 and headed off to the District 31 Toastmasters Conference (4 areas: 11,12,13,15). I had won my local Table Topics contest within my Lakesiders’ branch, but now this was going to the major leagues (the Districts). It’s difficult to prepare for a Table Topic speech because the kind of questions that one gets asked to speak on can range from “If you were a historical figure…” to a question about an animal, or to a quote or a fictitious character. I would have the chance to listen to the topic twice, and then I would have to instantly spurt out a well-designed, “mini-speech” for the next 2 minutes and 30 seconds— without going over the time limit. We were to be ranked on Speech Development, Effectiveness, Physical Appearance, Voice, Appropriateness and Correctness. As you can imagine, it’s almost impossible to prepare for this particular type of speech, but I wasn’t nervous; I knew that I would do my best. It felt like a coaching question. I was all over it! But I came in 2nd place. Joe won. Yes, Joe, the fellow who told me that they didn’t start counting until you spoke or gestured. I learned a lot from the District contest. The lesson learned was that sometimes you need to prepare an answer extemporaneously, and you need to organize your thoughts. It’s best to take a pause to do that, instead of just blurting out what’s on your mind. It humbled me. That evening, I went to a St. Patrick’s Day Feast at St. Camillus Church in Arlington. I was with my parents, my brother Bob, the Cauley girls and Chris, Joe and Marianne. The place was packed. It was a sellout. We all bought raffle tickets for the 50/50 and for the goodie baskets. 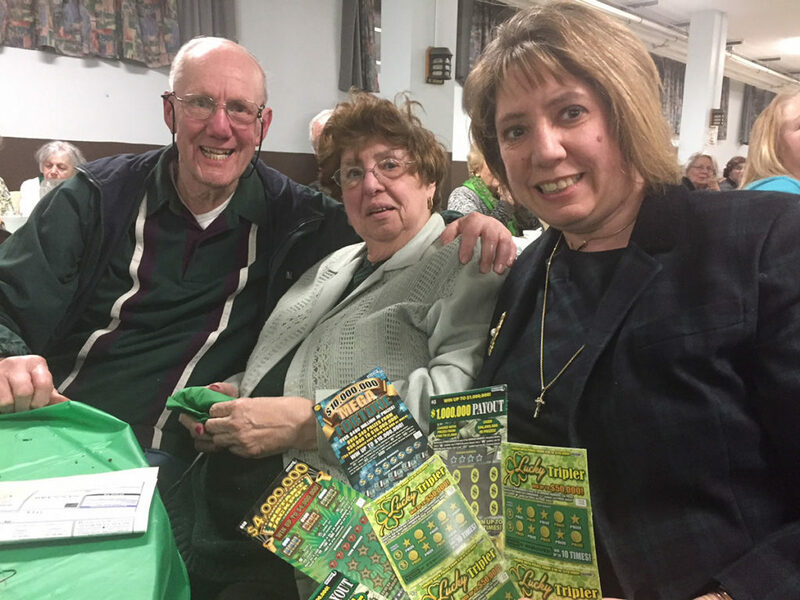 When we attended this event last year, I won the shamrock with lottery tickets—and as luck would have it, I also won this year’s lottery ticket shamrock! And my brother Bob won a basket full of gardening tools and plants, as well as some Irish things. He shared his basket with everybody at our table, and I got a lavender plant, Kathy got a sunflower plant, etc. No, we didn’t win the 50/50, but what was the chance of us both winning a basket prize—there were only 5 baskets. They say that it’s the luck of the Irish; well, we were Irish for the day and greatly enjoyed the corned beef, cabbage, potatoes, and carrots, as well as Irish bread, ice cream and cupcakes. It was truly a feast! John and John Robert were at a Scout overnight, so they missed both the morning and the evening festivities. I want to thank my brother Bob for again organizing a great table for the event. We had great seats and we could easily watch the Irish Step dancers. After having a few days to mull over the speech contest, what I realized was that it wasn’t about winning. It was about growing. It wasn’t my turn to win the speech contest, but apparently it was my turn to win the basket. Last year, my green shamrock won $105 and this year it won $44. But I only put $20 into it, so I am still up $22. I was a winner at the St. Patrick’s Feast night because I had a nice dinner with my family and special friends. I hope that you had a happy St. Patrick’s Day. The luck of the Irish was with the Italians in Arlington.